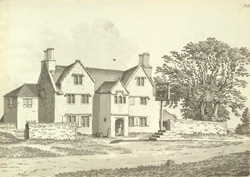 A view of the Bear Inn, called the Toghill House, near Wick in Gloucestershire. The sign of the bear is on display outside the inn. This inn was one of many built on the roadside to accommodate travellers. Diarists often commented on the quality of the rooms, food and drink available, thus creating an early version of the modern day travel-guide.